Solve It! Think of a clock or watch that has an hour hand and a minute hand. As minutes pass, the distance between the tip of the hour hand and the tip of the minute hand changes. 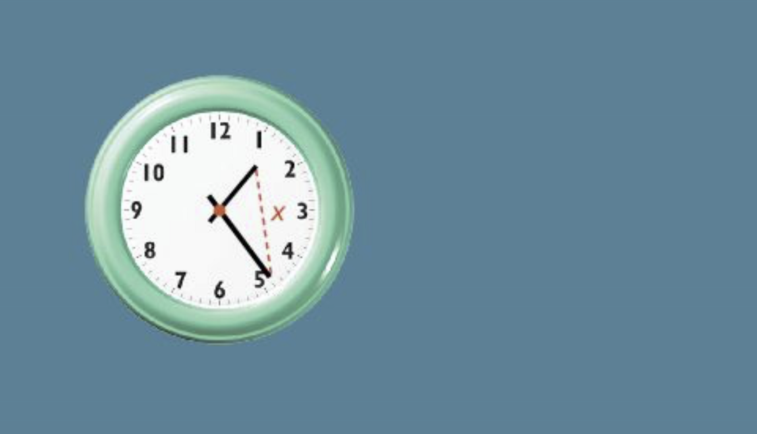 This distance is x in the clock shown. Sort the times below from least to greatest length of x ? Problem 1 Got It? 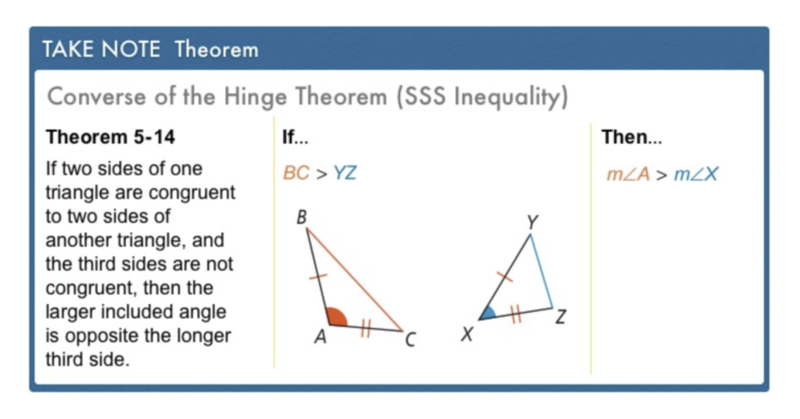 What inequality relates LN and OQ in the figure? Problem 1 Got It? 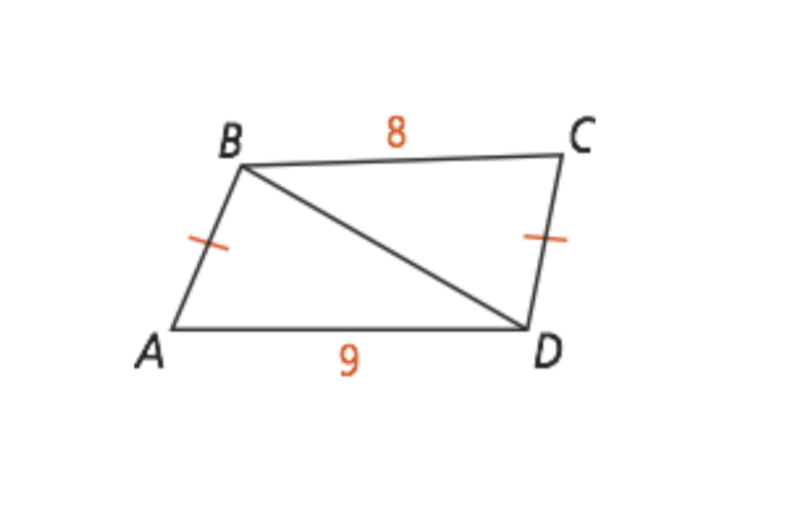 Reasoning: In △ABC, AB = 3, BC = 4, and CA = 6. In △PQR, PQ = 3, QR = 5, and RP = 6. 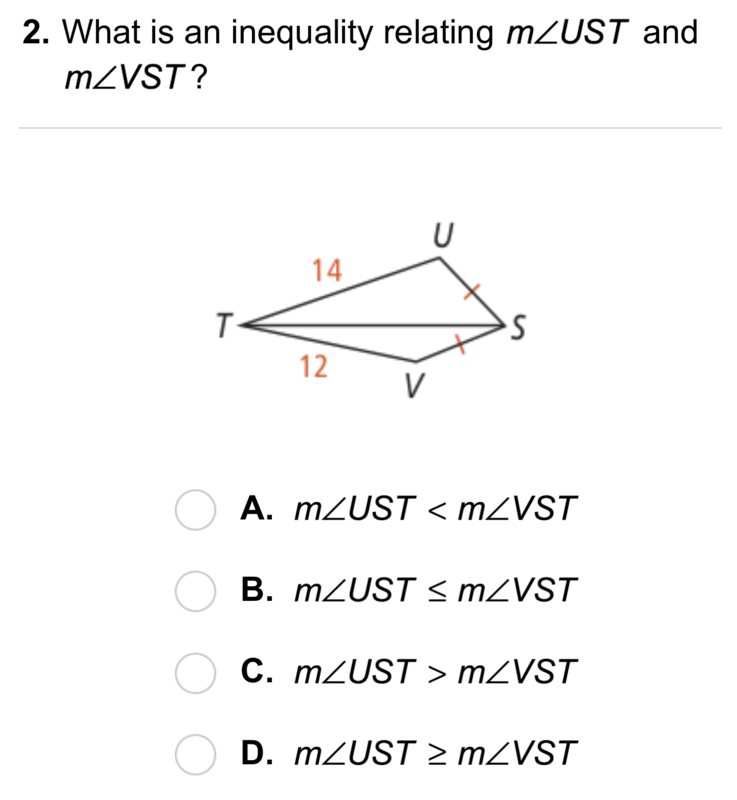 How can you use indirect reasoning to explain why m∠P > m∠A ? Problem 2 Got It? The diagram shows a pair of scissors in two different positions. 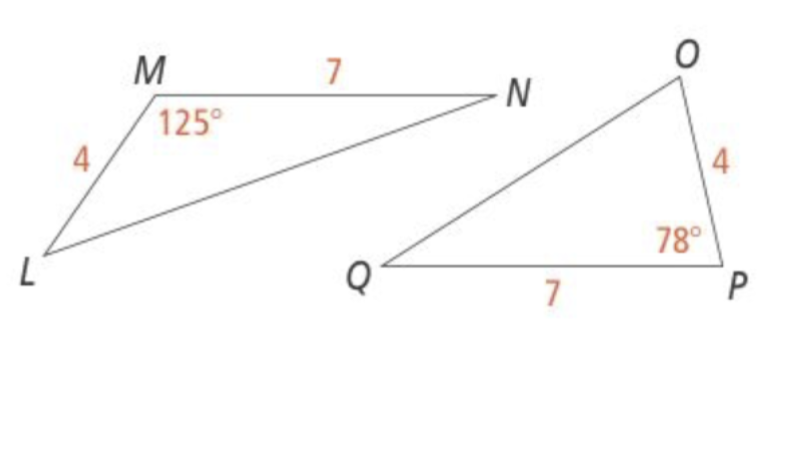 In which position is the distance between the tips of the two blades greater? The distance between the tips of the two blades is greater in the figure on the left. The distance between the tips of the two blades is greater in the figure on the right. The distance between the tips of the two blades is equivalent in both figures. Problem 2 Got It? 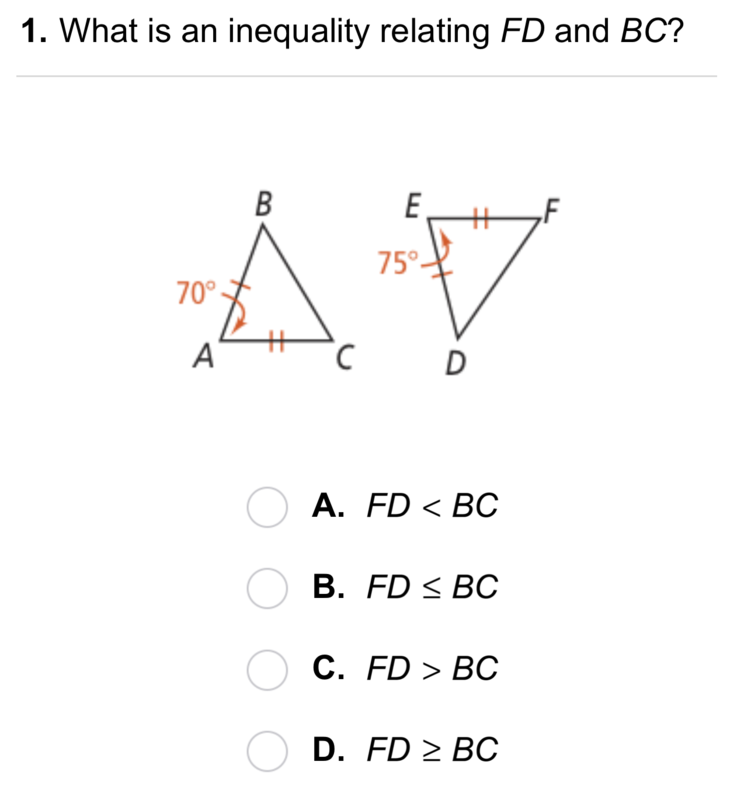 How does the Hinge Theorem apply to this scenario? Error Analysis: From the figure, your friend concludes that m∠BAD > m∠BCD. How would you correct your friend's mistake? 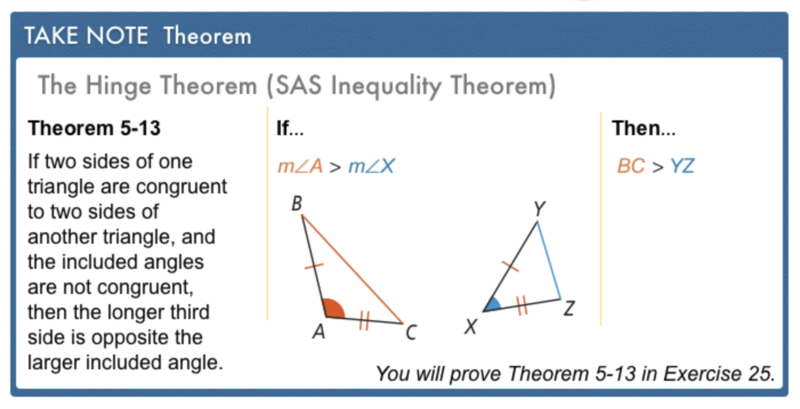 Compare and Contrast: How are the Hinge Theorem and the SAS Congruence Postualte similar? How are they different? 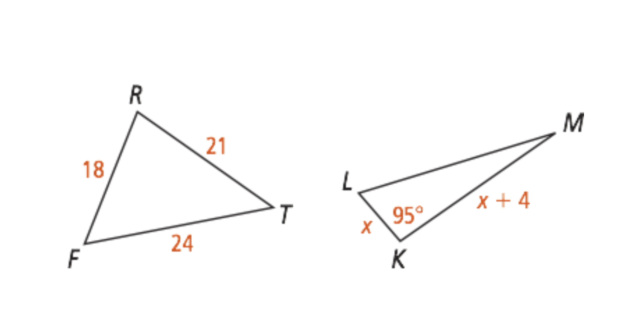 Review Lesson 5-6: Order the angles of the triangle from smallest to largest. 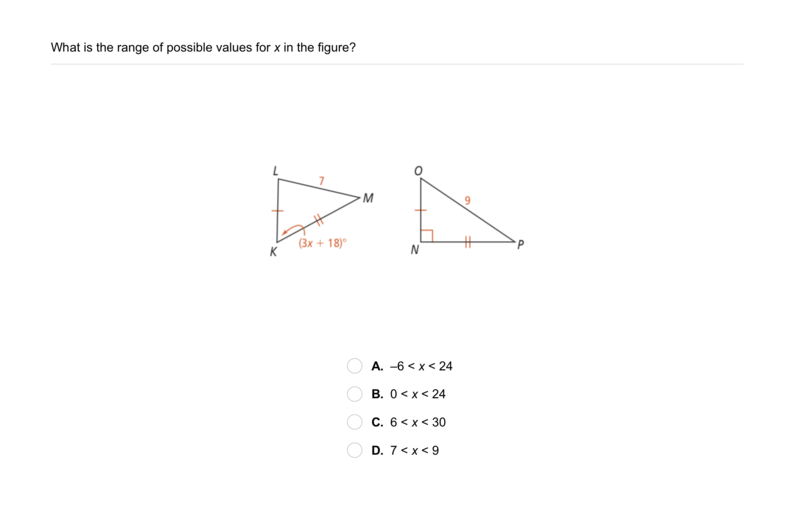 Review Lesson 5-6: Match the range of possible lengths for the third side of a triangle in the left column with the given lengths of two sides of a triangle in the right column. Not all ranges will be used, only one per pair of side lengths. Review Lesson 5-6: In △GHI, which side is included between ∠G and ∠H ? Review Lesson 3-7: Match the slopes on the left with the pairs of points on the right. Use Your Vocabulary: Identify which form of the word hinge is used in each sentence. Everything hinges on his decision. The hinge on the gate allows it to swing open or closed. Your plan hinges on your teacher's approval. The lid was attached to the jewelry box by two hinges.